The 3M Aqua-Pure AP117 single filter is the original replacement filter for the Whirlpool WHCF-GAC. It's rigid construction eliminates sediment unloading and yields a low pressure drop. 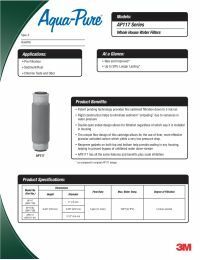 NOTE: The 3M Aqua-Pure AP117 single filter replaces the 3M CFS117 replacement cartridge. The only difference is the label on the cartridge. If we no longer have the 3M Aqua-Pure labeled AP117 cartridge in stock, we will automatically ship the 3M CFS117.